Are you a woman who likes her bags simple, yet stylish? Maybe you’re tired of multi-colored elaborate fabrics. If so, then Saint Laurent has the perfect bag for you – the Betty pouch bag. There’s no pizzazz here. No shiny-looking zircons or gaudy colors – just a smooth caramel hue and a small, stylish bag. Saint Laurent knows your taste and always delivers. So get your hands on the latest of the Fall/Winter 2018 bag collection. The Betty pouch bag is made from 100% calfskin leather. Unlike other types of leather, calfskin is hard and durable, so your bag won’t suffer too much damage. Most of its metal parts are of high-quality bronze, including the engraved plate which says Saint Laurent Paris. Classy, sturdy, durable and simple – perfect for a night out. This bag has nice, curved edges and is perfect for all you ladies that enjoy NOT drawing attention to yourselves. You can relax and enjoy this wonderful bag with its curved edges and streamlined form. The whole bag has a lovely suede lining for that extra fanciness. Considering how spacious this small bag is, you can carry it to work as well. A large interior slit pocket allows for enough room to bring everything you need. 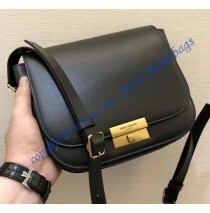 The bag also comes with an adjustable strap, so you can set its length any way you want to. Its front compartment is flat and perfect for your makeup, cell phone, or anything of that size. You will enjoy this bag thoroughly when you buy it, so go on – buy one today. 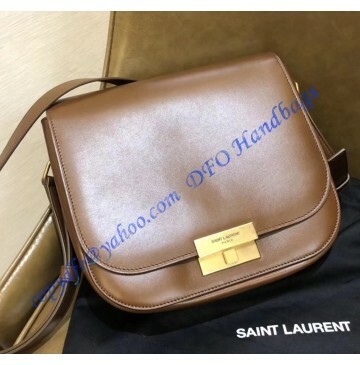 The Saint Laurent Betty pouch bag is 25 cm (9.8 in) wide, 21 cm (8.3 in) long, and 8 cm (3.2 in) deep. The shoulder strap drop is 45 cm (17.7 in) long, and you can adjust it any way you see fit. It comes in soft, smooth caramel, with bronze parts colored golden. The calfskin makes it both durable and lightweight. You can get the Saint Laurent Betty Pouch bag for $411 here.